China is leading the world in global manufacturing and production. America is blazing the Trail in artificial intelligence, cloud computing and the technological advancement of their Economy. In 2012, Nigerians spent an estimated N160billion Naira on Tuition Fees for their children abroad and to be more specific, Vanguard reported on Feb 10 2016 that about 2 Billion Dollars was invested in School Fees in Ghana with about 75 000 Nigerians as Students there. Guys, this is Ghana. Ghana o. Down the road here. Not South Africa, Dubai, France, Germany or China. It’s Ghana o. Black Africa. West Africa. Far Smaller in Size, Population and Revenue than Nigeria. Not without its fair share of “leaders with horns’ but at least, we can’t build an Education System fit for our own not to talk of Foreign Students, abi? We should be worried. We should be very very worried. In Nigeria, we produce everything we don’t consume and consume everything we don’t produce. We even import Toothpick. It’s such an irony that Youth Unemployment remains one of the greatest challenges of our Country, yet we keep importing Labour from other Countries instead of training our own youth to become empowered and eligible for these Jobs. We spend billions of naira paying low cost skilled labourers from Togo, Benin Republic, Ghana, Cote d’Ivoire and Niger and high level expatriates from China, Lebanon, India, the Philippines etc. We are merely deliberately rendering our Youth Useless. Join us at 11am on Saturday, 13th August 2016 at the Multipurpose Hall C, University of Lagos (UNILAG) Akoka, Yabafor very robust conversations with thought leaders and Professionals from various alternative Industries to our monolithic Oil Economy and practical insights on how the successor generation of Nigeria will survive in the post oil era by focusing on acquiring major skills with or without formal education with our Speakers providing perspectives for an all- inclusive future. CHIEF EMEKA ANYAOKU,Former Secretary-General of the Common Wealth who has been advocating for the restructuring of Nigeria in recent times is the Distinguished Chairman of the Occasion. The Governor of Ondo State, DR. OLUSEGUN MIMIKO headlines as Keynote Speaker and they will be joined by KUNLE AFOLAYAN – Actor, Film Producer and Director;AISHAH AHMAD – Group Head, Consumer Banking & Wealth Creation, Diamond Bank PLC and Chairperson of the Governing Council of WIMBIZ – Women in Business Management and Public Service; JOY ISI BEWAJI – Feminist Writer, Newspaper Columnist and TV/Radio Presenter; AUDU MAIKORI- Lawyer, Social Activist and President of Chocolate City Entertainment Group; NKEMDILIM BEGHO, Founder/MD, Future Software Resources and OKECHUKWU OFILI, Founder of Okadabooks.com. 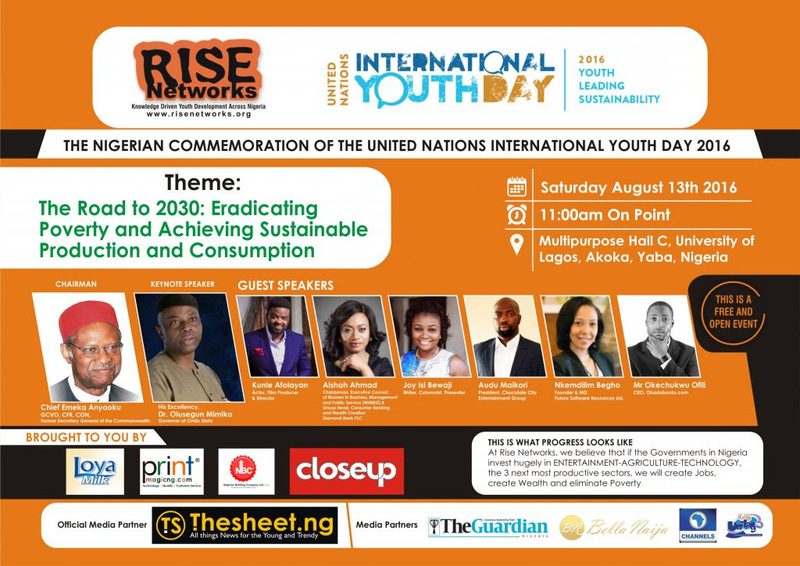 This Program is hosted by Rise Networks, Nigeria’s Leading Social Enterprise on Youth in Education, Entrepreneurship and Public Service in partnership with the UN Office in Nigeria to mark the 2016 Celebration of the United Nations International Youth Day. Just show up and let’s work out solutions to these issues. 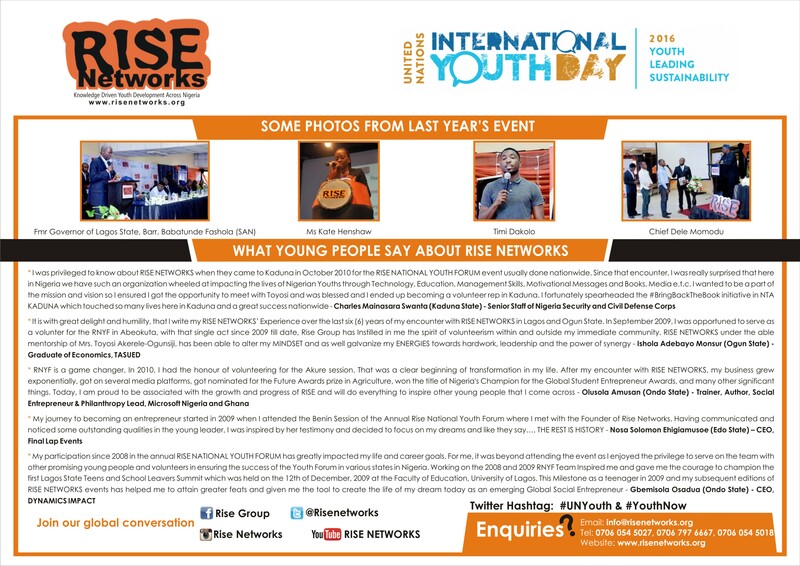 Email or call us if you have questions – rise@risenetworks.org / 07060545018, 07060545027, 07067976667.